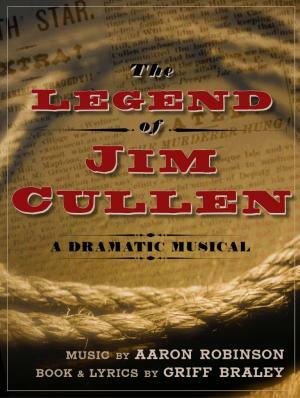 The Legend of Jim Cullen weaves storytelling, drama and history, songs and musical numbers, dance and movement into a spectacle driven dramatic musical. Our production evokes a world of vaudeville, carnival or early American theater. 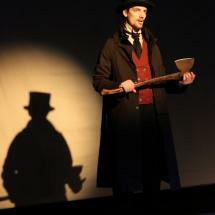 With an ensemble of players supporting the story told by the central character, Professor Bateman, the play arcs in style from vaudeville to realism to fantasy in scenes that include a river baptism on the ice in New Brunswick, a log drive, an axe murder, and a lynching. Perspectives on how legends grow, personal responsibility, and multiple viewpoints weave around Professor Bateman's examination of the question: "What is the soul of man?" The music landscape for Jim Cullen presents a broad aesthetic; while rooted in traditional music appropriate to the period, the approach includes modern sounds, a strong Broadway feel, large choral pieces and character driven solos. In our workshops and auditions, comparisons have been made to Floyd Collins, Big River and other musicals deeply rooted in American lore. At the same time, the play delves into modern myth with a visual spectacle that combines a sense of place with an urgent sense of storytelling.